Have a few questions about serving alcohol in New Mexico? We’ve got you covered! Here at NMRA, we answer a lot of calls and inquiries about alcohol service. Maybe you’ve even taken one of our Servers Permit classes. Based on the most frequently asked question of our association, we have put together vital items to keep in your toolbox when it comes to serving alcohol. NOTE: Our answers are based on the regulations for the State of New Mexico. If you are serving in another state, consult your local restaurant association or applicable board. We have provided a copy of the Alcohol and Gaming Division Regulations at the end of this post as a service to the industry. It is not a substitute for legal advice. Please seek the assistance of a licensed professional in any legal situation. 1. What hours can I sell and serve alcohol? For a Restaurant Liquor License (beer & wine), the hours of operations are from 7:00 am to 11:00 pm or until meal service ceases – whichever is earlier – from Monday through Saturday. For all other license types, it’s from 7:00 am until midnight for package liquor sales and from 7:00 am until 2:00 am for on-premise consumption. For a Restaurant Liquor License, it’s 11:00am until 11:00pm or until meal service ceases – whichever is earlier, on Sundays in a local option district that has voted to allow Sunday Sales by the drink. For all other license types, legal hours of operation are from noon to midnight for both package liquor sales and on-premise consumption in local option districts that have voted to allow Sunday Sales. Licensees wishing to sell, serve or permit the consumption of alcoholic beverages on Sundays must have applied for and received the appropriate permit from the Alcohol and Gaming Division. Not all local option districts allow Sunday sales. Please contact the Division to see if the sale or service of alcohol on Sunday’s is permitted in your area. 2. Are there special rules for certain Days? Holders of dispensers, restaurant, club and governmental licenses that have a current, valid food establishment permit may sell, serve or allow the consumption of alcohol by the drink on the licensed premise from noon until 10:00 pm or until meal service ceases – whichever is earlier – for Restaurant Liquor Licenses. When Christmas falls on a Sunday, sales are only permitted in those local option districts that have voted to allow Sunday Sales. There are no package sales allowed on Christmas Day. 3. Who am I NOT allowed to serve? 10.51.11 Sales to intoxicated persons: No licensee shall sell, serve, procure or aid in the procurement of alcoholic beverages to an intoxicated person if the licensee knows or has reason to know that the person is obviously intoxicated. 10.33.10 No Sale, service, possession or consumption permitted: Under no circumstances, may minors purchase, be served, possess or consume alcoholic beverages on a licensed premises, and nothing in these rules, including provisions, permitting minors on licensed premises, shall be constructed as permitting the sale or service to, or possession or consumption of any alcoholic beverage, by a minor on a licensed premises. Both the server and the licensee can be cited for serving minors or intoxicated persons. Check the regulations (in the helpful links below) for penalties involving sales to minors or intoxicated person by licensee and by server. 4. What are some signs of someone who is intoxicated? 5. What should I look for when checking ID? Check for an ID’s state specific qualifications. Use and ID reader guide if you need to. 6. What do I need to know about serving pregnant women? Serving pregnant woman – In New Mexico it is legal for a pregnant woman to consume alcohol. Refusing to serve alcohol to a woman because she’s pregnant is gender discrimination. 7. Can I serve alcohol without a permit or expired permit? No. Also, when your permit expires, you do NOT have a 30 day grace period to replace it. The grace period in the rule below ONLY applies to those who have never had a permit. Server permit required every licensee or lessee who is directly involved in sale or service of alcoholic beverages, and all servers must satisfactorily complete a program every three years to obtain a server permit. No person shall be employed as server on a licensed premises unless that person first obtains a server permit, except that a person not previously certified must obtain a server permit with 30 days of employment. 8. If my guest has a designated driver, is it okay to overserve them? No. This is NOT allowed. All guests are treated equally when serving alcohol whether a designated driver is present or not. The rules in #3 above apply regardless of transportation. 9. Are posters required to display? Poster warning of the dangers of drinking alcoholic beverages during pregnancy. Posters warning of the dangers of, and penalties for, driving while intoxicated. No Firearms Allowed Poster: To be posted in any restaurant that has elected to prohibit firearms of any kind, whether open or concealed, on its licensed premises by conspicuously posting this sign, and in all other licensed premise that are licensed to sell beer, wine, or spirits for on-premise consumption. No Firearms Allowed EXCEPT Concealed Carry Poster: To be posted on all licensed premises that do not sell alcoholic beverages for consumption on the premise, or restaurant that has not elected to prohibit firearms of any kind whether open or concealed, on its premise by conspicuously posting the sign on its premises. 4c. No Firearms Allowed by Election of Landowner Poster: To be posted on all licensed premises that do not sell alcoholic beverages for consumption on the premises but choose to prohibit all firearms at the election of the landowner. 10. Do I have to keep records/copies of server permit? a temporary, written document, such temporary proof shall be available at the licensed premises in either a hard copy or as a scanned electronic copy to be made available upon request. The licensee or lessee, not any server, is responsible for compliance with this section. 11. What are the age requirements to obtain a server permit? Only individuals over 21 years of age may sell or serve alcohol in bars, lounges convenience, grocery and package stores. 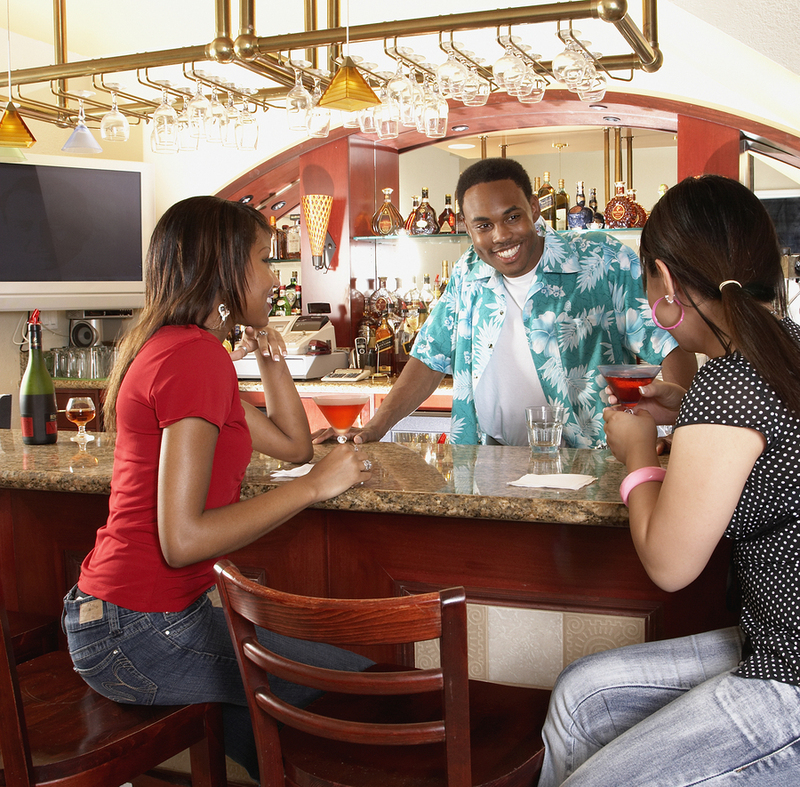 19 and 20 year olds may obtain a permit to sell or serve alcohol in a full service restaurant with meals, but may not be a bartender. This only applies to Restaurant Liquor Licenses. Have a question we didn’t answer? Contact us and we will add it to the list!